You were right....I was wrong. It did turn out. 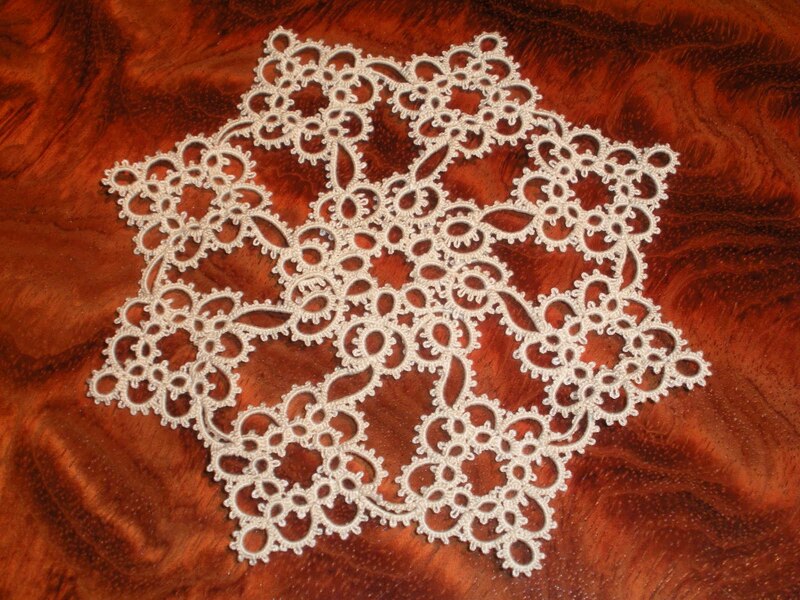 Below you see the final Ice Crystal doily. It turned out quite nicely. I don't think the 'dropped' joins really matter. And, you were also right when you said continuous reference to the pattern was necessary. 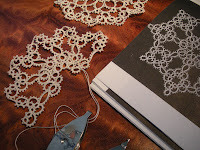 I was not able to move away from the pattern as the repeats were quite involved. As the discussion continues out in Tat-land about traditional tatting verses front-side tatting...I figured I'd give it a whirl. 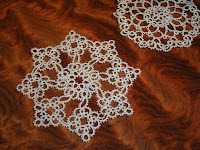 This was my first attempt at front side tatting. I think I only forgot to do the front side tatting on one of the outer rings. I'm pretty content with that. Now, I'm starting the second course (artisan) stage for the T.A.T. proficiency program. The first stage (apprentice) was a wonderful learning experience in which I acquired several new techniques. The jury was quite nice with only a few surprises. I've waited quite awhile for this stage as there are a few things I'm not 100% interested in learning. However, I will probably really appreciate the learning. I really want to work through this stage over the next couple months. Have you all worked through this and what was your experience? I've been a bit busy over the past several months. I'm adjusting to increased hours at my main 'big boy' job. Ergo, I've not been able to tat and socialize as I would like. 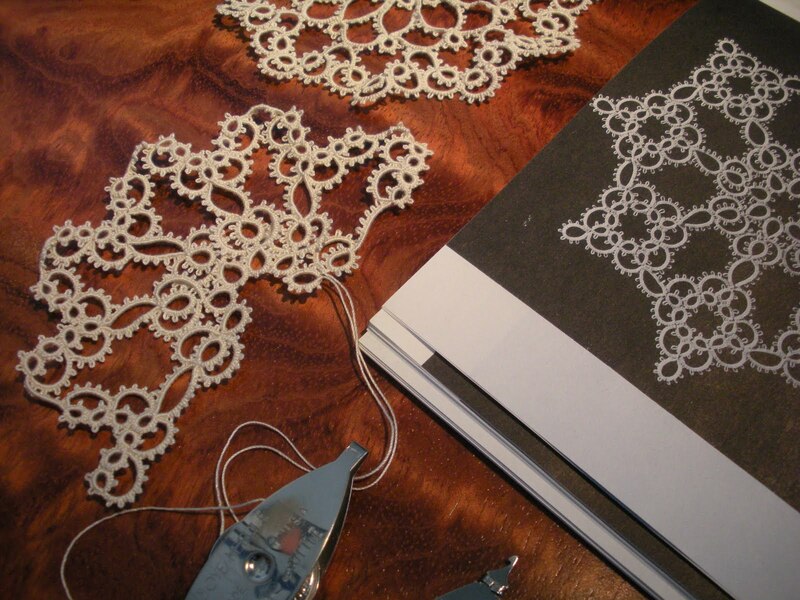 But, not to worry, I'm still tatting. I've got alot of catching up to do and will be reading blogs and seeing what ya'll have been doing over the winter holidays. For me, I'm a bit frustrated with a pattern. I finished another Sunflower doily by Blomqvist and Persson. That one is always a bit of a challenge. But, I started their Ice Crystal pattern and have had to trust that it is going to turn out alright. 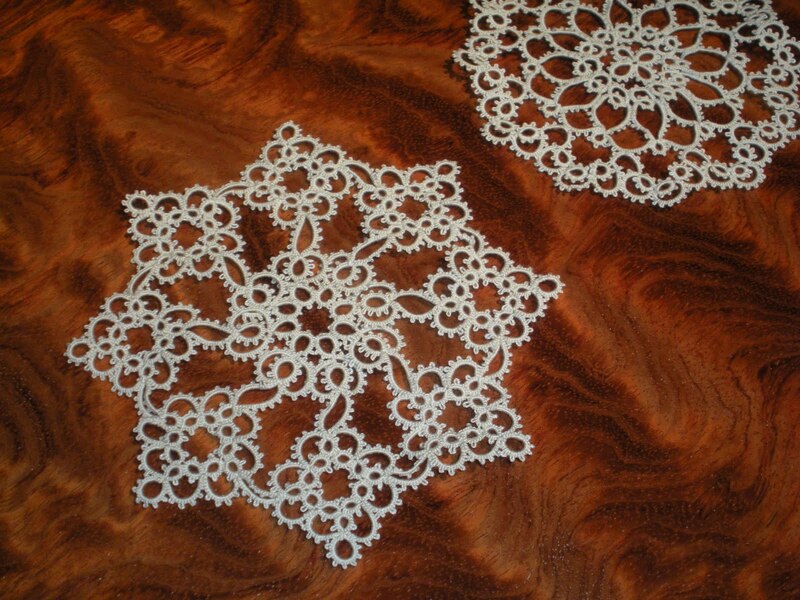 The completed (unblocked) doily is the Sunflower doily and then there is the other mess. 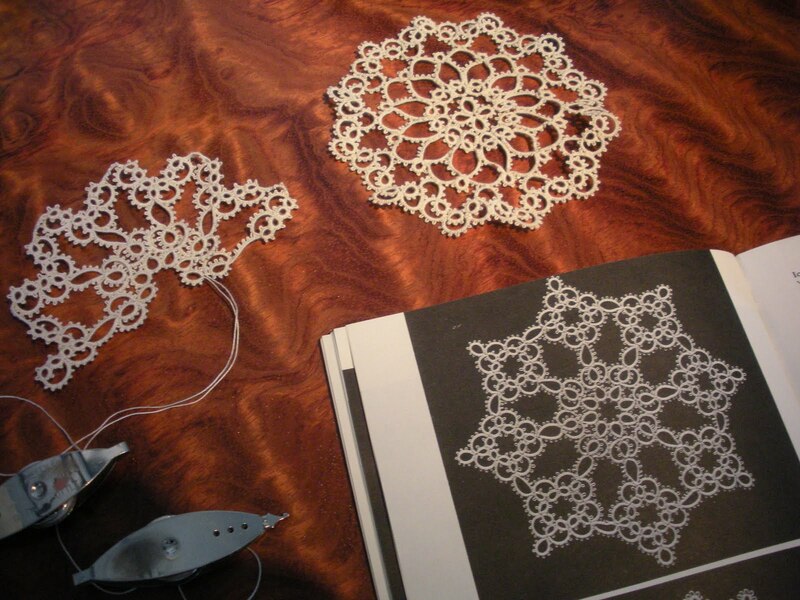 I realized after two trips to the center rings I was supposed to join the last chains as I tatted toward the center ring...oops...so, I'm working to keep the consistency throughout the doily...have I made a major mistake?...the jury is out. 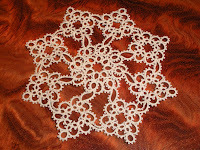 And THEN, as I was tatting this morning I found that I joined the previous center ring in the wrong picots....UGGhhh! I'm ignoring that one and tatting as if nothing ever happened. So, has anyone worked this pattern before and what was the outcome? Did you have the mess going on that you see above? Please send the good vibes my way. It's great to be back in here and a giant HAPPY NEW YEAR!